A peek inside the colourful Ovolo The Valley Brisbane, due to open in November. A multi-million dollar evolution of The Emporium Hotel in Brisbane has commenced ahead of the property’s grand unveiling next month as Ovolo The Valley, the Queensland flagship of the burgeoning brand. 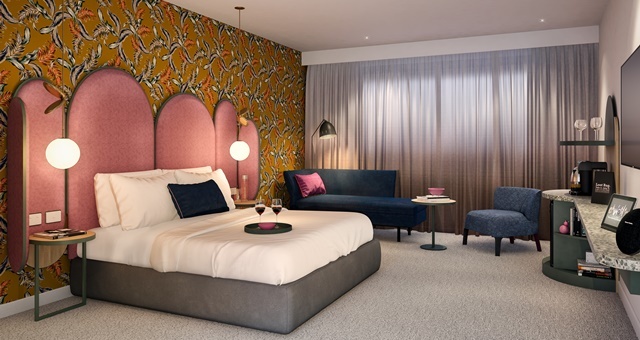 The rapidly growing Hong Kong-based brand has appointed architecture brand Woods Bagot to deliver a hotel firmly in tune with the culture and quirk of its surrounding Fortitude Valley precinct, complete with colour, personality and charm across its 103 rooms. Woods Bagot is the design firm behind the ongoing regeneration of the city’s Howard Smith Wharves and Sydney’s The Ivy hotspot. Ovolo has instructed its designer to incorporate the hotel brand’s “playful, forward-thinking spirit” into the new property and are confident that is what will be delivered once doors are opened to guests. In total, it is understood Ovolo has invested around $55 million into the transformation of The Emporium into Ovolo The Valley. In addition, the hotel’s independent restaurant and bar will also be transformed in collaboration with former Brisbane-based designer Chloe Want from AvroKO and is due to open early next year. 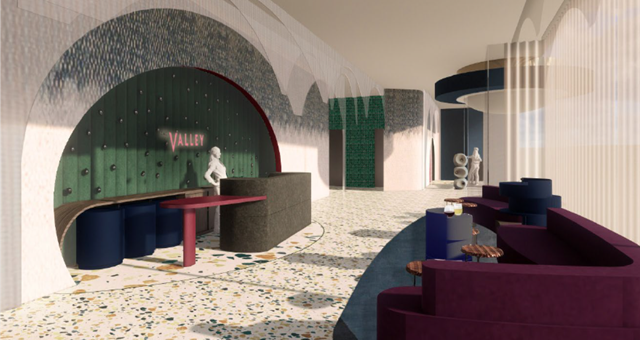 Company CEO and Chairman, Girish Jhunjhnuwala, says he is confident Ovolo The Valley will become a market leader for Brisbane in the near future through its design, customer service and guest feedback. Every corner of Ovolo The Valley has been reimagined by design firm Woods Bagot. Woods Bagot has adopted into its room and hotel design a menagerie of colourful elements including custom wallpaper, commissioned art pieces and “eccentric” furniture. The designer has pointed out its signature “rock star suites” which feature velvet lounges and a gold bar in honour of the late David Bowie. Ovolo The Valley will also offer the latest in modern technology for guests, including flat-screen televisions with fitted Google Chromecast, in-room phone chargers and the Amazon Alexa virtual assistant. Guests will receive free wi-fi, breakfast, in-room mini-bar, laundry and happy hour drinks included in room rates. Additional guest facilities include a rooftop swimming pool, fitness centre, sauna and a variety of meeting spaces for corporate or function use.